ZFC Item Print Page - U.S. 15 Star Union Jack - Merchant ship Vineyard. U.S. 15 Star Union Jack - Merchant ship Vineyard. 15 Star U.S. Jack- Merchant ship Vineyard, 1796-1818. As with British maritime traditions, Americans had three flags on their naval vessels: The ensign at the stern, the jack at the prow, and the commission pennant at the main mast. The jack was a "union flag." That is, it showed the constituent parts of the country. The ensign incorporated the union as its canton. Thus, from the very first Stars and Stripes variant of the Revolutionary period, the American jack has been blue with the white stars corresponding to the number of states. The size of the canton for the ensign is the same as the size of the jack. Therefore, the jack in this collection must have required a very large ensign. Privately-owned vessels were not supposed to fly a jack unless they were commissioned as privateers. Nevertheless many of them used a jack in order to get the respect accorded warships on the high seas. It is therefore quite possible that the jack in the collection was used by a merchantman, although it might also have come from a U.S. Navy vessel. Although 15-star flags were used for almost a quarter-of-a-century, they are extremely rare. The field is made of dark blue bunting, pieced horizontally by hand. There are three horizontal rows of off-white cotton, each containing 5 stars of 5 points each and totaling 15 stars. These have been appliquéd to the reverse of the field and the blue bunting behind them is cut away and under-hemmed to show the form of the white star from the other side of the flag. A 2-inch wide, white, linen, canvas heading finishes the hoist edge. Sleeved for display. Marked W.H. Bartlett, New Bedford, Mass., who has been identified as a 19th Century collector of whaling and nautical flags. Madaus, Howard M., Dr, Whitney Smith, The American Flag: Two Centuries of Concord and Conflict. Santa Cruz: VZ Publications, 2006, p. 32. •	Ship Vineyard, sometime prior to 1818. •	Collection of W.H. Bartlett, New Bedford, MA.,until death in 1863. •	W.H. Bartlett, Estate, New Bedford, MA. •	Flayderman Collection, Fort Lauderdale, FL, until 1997. •	Sold via Butterfields, San Francisco, CA, to the Zaricor Flag Collection 1997. Smith, Whitney, A Report Prepared by the Flag Research Center On The 15-Star Flag of the Zaricor Flag Collection, Winchester, Flag research Center, 2004. Damage Used, worn portions of the fly are missing. Comment: Following English naval traditions, sailing ships commissioned in national service raise a jack when in port or at anchor. In the British Navy, the jack consisted of a duplicate of the canton of the ensign, the combined crosses of St. George, St. Andrew, and (after 1803) St. Patrick on a dark blue field. After the adoption of the Stars and Stripes, the U.S. Navy followed suit, but the jack consisted of a dark blue field bearing the same number of stars as US flag. The size of the jack was to be the same as the canton in the U.S. ensign. 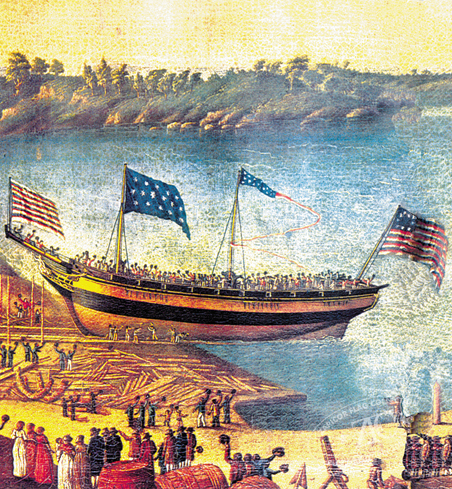 As the traditional dimension of the fly (length) of the canton on a U.S. ensign was 4/10ths of the overall fly, the complimenting ensign flown from the ship that bore this jack would have been 24 feet long on the fly. Correspondingly (assuming that the ensign bore fifteen stripes), its height on the hoist would have been 15 feet. This flag was flown on the ship "Vineyard" during the first two decades of 1800. There is evidence the flag once had a 16th, likely 17th and possibly an 18th star, which would make it an unofficial Jack. However, due to wear and use on the ship, the flag was re-hemmed, discarding evidence of the other star or stars of that vertical row, and therefore making it an official Jack at 15 stars till the Third Flag Act of 1818. Provenance: Acquired by the Zaricor Flag Collection (ZFC0418) in 1997, ex. N. Flayderman Collection. Publication Copy Madaus, Howard M., Dr, Whitney Smith, The American Flag: Two Centuries of Concord and Conflict. Santa Cruz: VZ Publications, 2006, p. 32. Flag traditions of the United States Navy and of the U.S. merchant fleet are largely influenced by the practices of the Royal Navy and Merchant Marine of Great Britain. In the late 18th century, the British Union Jack, a combination of the crosses of St. George and St. Andrew, flew on the jack staff at the prow of British ships, while its design appeared in the canton of various ensigns hoisted at the stern of those vessels. The U.S. ensign bore a field of stripes with a canton of blue bearing white stars. The design and size of the jack corresponded to the canton of that ensign. This flag now bears 15 stars in three horizontal rows of 5 stars each, corresponding to the official U.S. jack for 1795 - 1818. At some point it may have borne two or three additional stars. Only the tip of one of those stars still remains, hidden in the (shortened) fly hem. The linen heading of this flag bears the inscription "Ship Vineyard." This may be a reference to a sailing schooner of that name that plied between New York and Baltimore in the employ of the Regular Line, a shipping company in business in the first half of the 19th century.